We sincerely appreciate your interaction and enjoy your participation on Social Media Examiner and our social media sites. Thank you! #3: Post This Fan Badge On Your Website! You can follow the Social Media Examiner LinkedIn Page. LinkedIn is also where we host the private community for Social Media Marketing World. Join our Facebook community! This is a great place to interact with the Social Media Examiner community. Already a fan? Recommend us to your friends! Connect with us on Twitter! Find out what’s going on in real time. Follow the Social Media Examiner Instagram account and connect with our community there. We share tips from our speakers, fun photos from our events and a little social media humor. 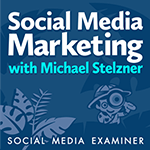 Subscribe to the Social Media Examiner YouTube channel. 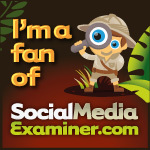 Thank you for being a fan of Social Media Examiner!